Finally, after a bunch of romantic comedies, dramas, and a well marketed flicks, comes the most magical and fascinating adventure ever seen yet, The Spiderwick Chronicles. Based on the five books written by Tony Dieterlizzi and Holly Black, this movie has everything that a Fantasy movie can have: magic, adventure, story, fearsome villains and captivating heroes. It is non stop fun for children and adults, and to put more icing on the cake, the movie is available on the IMAX which makes this adventure a more pleasant experience. Nickelodeon and Paramount picture created a wonderful picture that entertains but at the same time teaches us valuable real life lessons, it is the family event of the year. The Spider Chronicles is rated PG for scary creature action and violence, peril and some thematic elements. The story is about the Grace family. After going through a divorce, Helen (Mary-Loise Parker), Mallory(Sarah Bolger) Jared and his twin brother Simon (both played by Freddie Highmore) move from New York to an isolated and decrepit house that used to belong to her Helen’s grand uncle. Jared, the most trouble kid for the separation which is hoping that his dad comes and take him back to New York, begins to notice that strange things are happening in and outside of this house, but everything falls in place when he finds a secret studio belonging to his grand grand uncle Arthur Spiderwick. In the hidden room Jared finds and opens a book called Arthur Spiderwick’s Field Guide to the Fantastical World Around You, which possesses valuable information about all the different creatures that live undetected to the human eye. He later meets the house brownie, Timbletack, who becomes friends with Jared. Timbletack tells him the story about Spider wick’s book, the secret it conceals, the other realm, and the war against a malign ogre, Mulgarath, who wants the book for himself, and would do anything to get it. Everything goes crazy when Mulgarath and his ogres find out about the book and confront Jared and his family, now is up to them to prevent Mulgarath to obtain the precious book. The story itself is great, now the approach and delivery of the whole staff is fantastic. Director Mark Waters did an outstanding job merging the five books into this magical masterpiece. He surely knew what to pick from each one and presented it to the audience in the best way possible to keep it in the movie. Although, the movie has some fictitious characters and the main conflict involves the magical world , Waters does not overemphasizes it, he shows us what we need to know and presented it in a real setting making the audience believe that it could be possible. The heroes are real and ordinary people; they do not have any powers, or have magical object to protect themselves; they have to rely in their own and in each others abilities and qualities to survive. Another important side of the movie is that the heroes are also presented with real life conflicts and behaviors shared by many families today; it touches problems like divorce and its effect in kids, relationship between brothers and sisters, and the parents-child relationships, along with teaching us to appreciate nature. The cast did an incredible job. 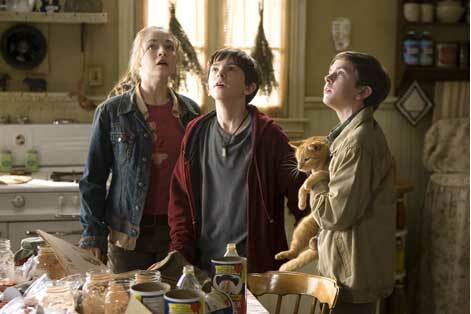 Freddie Highmore really impressed me doing his double role. He portrays each character with great skills, adding the necessary qualities and personality to each one making the audience believe that there is actually twin brothers acting in the film. The voices of the main fictional character are well interpreted by their respective actor, Nick Nolte was perfect in the Mulgarath role along Martin Short in his role of Thimbletack. Audio visually speaking the movie looks amazing, watching it in the Imax takes the movie to another level. The audience will feel they are part of that world, and the special effects are great, from the house, the backyard to the magical creatures everything look astonishing. All the characters are well develop from the fairies to the ogres, all of them have a sense of property that make them unique and adequate for the movie. Also many of the CGI characters were really charismatic like the fairies, Thimbletack, and my personal favorite Hogsqueal, which adds the humor part to the movie with its funny remarks and amusing actions, it reminded me of the Genie in Aladdin, Timon in The Lion King, and Boots from Shrek. The only negative opinion about the movie is that the main villain was design somewhat scarier than what it should been, many young kids will be jumping out of their seats in some scenes where this villain appear, and that aside the villains there was not that much interaction with the other characters that appear in the books. With a great cast performance and an intelligent script and spectacular effects the Spiderwick Chronicles depicts almost the same magic and adventure of the five books. If you are waiting for an epic adventure like The lord of the Rings, you might be disappointed, since there is no extraordinary journey through incredible worlds and mesmerizing computer scenes , nonetheless, the movie has magic in its own that will captivate and surprise you as these epic movies did, I recommend this movie for all fans of the fantasy and or family genre who like movies like Bridge to Terabithia, the Never Ending Story, and Pan‘s Labyrinth . The Spiderwick Chronicles is the perfect blend between reality and fantasy, it is the most imaginative movie since Pans’ Labyrinth. I saw the movie in a special premiere last night. I really enjoyed it! The creatures were cute, funny, and scary. The special effects were good. The movie gets pretty scary and intense in places, but there is a lot of humor mixed in that breaks the tension. I believe that this movie is appropriate for kids 7 years old and above, though I saw some younger children who enjoyed it. I think that it is a very good family movie. My son is going to be upset that I saw it without him, but thankfully, I am willing and even eager to see it again. This movie was pretty good. I thought it was too much like Bridge To Terabitha, though. The creatures and charecters were very similar and I think they could have made that better, but overall it was pretty good. The books are very good. Any one who reads this should read the books then watch the movie. Loved it. An amazing movie. A lot like Bridge to Terabithia but if you like that movie, you'll like this one. Very good. My full support. I was really excited to see this movie but came away from it less than satisfied. From the flat "flock of cows" joke on, the dialog was stilted and the character development near non existent. Though the acting was good and the effects were entertaining, the movie had an overall feeling of a Disney straight to Video release. Even the editing seemed a little off with characters standing inside shots they didn't seem to belong in. and she was scared it was funny for me. BYE! This movie is a great mystery comedy and action story.I love how the characters dont seem like thier acting they its almost like it was really happening! I read the books to my son and couldn't wait to see the movie, and now i remember why i usually see the movie BEFORE reading the book... I expected some things to be left out for time crunch etc but it was way too different - a good enough movie on it's own but i was very dissapointed by how much it di NOT follow the book. crazier still on the dvd all the deleted scenes are very pertinent to the story and were pretty much straight out of the book - i felt the movie would have made more sense with them.